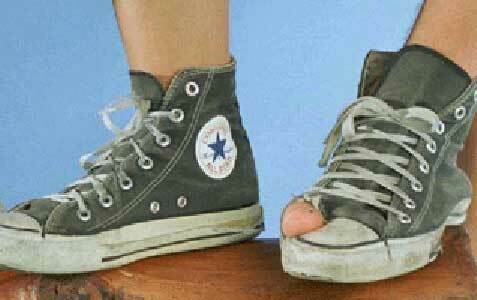 If you can see your toe, it’s time for a new pair of chucks. I am insanely happy over a purchase I made today. Two new pairs of Converse chucks! Hopelessly fashion-stuck in the 1980’s as I am, these are my preferred footwear. Back in high school and college, I had about 6-7 pairs of these old-fashioned hi-top sneakers in many vivid colors. I bought them all at the Converse factory outlet store in Malden, and every single pair managed to fall apart except for one; a set in the oddest shade of blue I’ve ever seen in footwear. I think I purchased them in 1986, wore them sporadically through college, in rotation with my red, black, white, and multicolored ones, and they were the only ones that stood the test of time. The soles were the first to go, as they always are on chucks. It’s just a flimsy piece of rubber stitched onto very thin canvas, which tends to give way and flap as you walk. Most of the time, the soles fall apart near the toe, which makes them unwearable quickly, but my blue chucks fell apart at the heel, which meant that most of the time, you couldn’t see my socks through the shoes. After that, the grommets on the sides fell through the canvas, which wasn’t a big deal. Any self-respecting chucks wearer has no attachment to the grommets. The wider holes make for fun playthings while sitting Indian-style in a chair. You can poke your fingers or pens or paper clips through them and scratch or tickle the soles of your feet. I don’t know what prompted me to make the trip to the store today, but they were having a sale, which made me happier than I’ve been in a long while (retail-wise). Buy one pair, get the second half off! I ran to the chucks section and looked through all the colors they had. I considered a lemon-yellow pair, and an all-black pair (the rubber toe caps and laces are always white, which made the all-black version look that much cooler). They had an interesting color called “sea green,” which is just about the same color I want to paint my bedroom walls. In the end, I resisted the allure of all the more trendy 90’s-style colors and bought a pair of regular black and unbleached white. I think I wore enough outrageous colors back when I was a teenager, and this is my concession to growing up. Yes, my feet look like I stepped out of a Katrina and the Waves video, but in an understated way. To celebrate, I immediately put my new black pair on, threw some 80’s pop into the stereo and “broke them in” (for a shoe made of material as thin as an average pair of jeans and with soles that have exactly zero percent arch support, this takes about twenty-five seconds) while dancing around the apartment, picking up dishes and throwing away telephone books. I dusted while Duran Duran played and scrubbed glassware to the beat of Danielle Dax. My blue chucks are sitting under the desk in my office. I’m not sure what I want to do with them. They’re beat-up, torn, and look horribly, horribly sad, but how can I possibly discard a pair of sneakers that I managed to wear for 15 years? Maybe I’ll put them in one of the boxes my new chucks came in and retire them into a place of honor. Somewhere in the back of my clothes closet. In another ten years, I’ll probably take them out and start wearing them again.